We developed a visible-light driven direct synthesis of ethylene glycol, a key chemical for the manufacture of PET, from methanol with 90% selectivity. MoS2 nanofoam-modified CdS nanorod catalyst enables the preferential activation of C-H bond in methanol while keeping its OH group intact, forming •CH2OH intermediate for C-C coupling. The activation of stable C-H bond is a constant challenge in chemistry. It is even more difficult to activate the inert C-H bond preferentially with other functional groups (e.g., OH) in the same molecule keeping intact. Selective transformation of C1 (e.g., CO, CO2, CH4 and CH3OH) into C2 (e.g., C2H4 and HOCH2CH2OH) molecules via controlled C−C coupling is another challenging and attractive target. We recently succeeded in the activation of C-H bond in methanol while keeping its OH group intact, forming ethylene glycol (EG) with 90% selectivity together with H2 (Eq. 1). EG is a versatile chemical with many important applications, in particular for the manufacture of polyesters, predominantly poly(ethylene terephthalate) (PET). One key to the success is the harnessing of solar energy to realize the room-temperature dehydrogenative reaction to break the thermodynamic limitation. Solar energy-driven photocatalysis has attracted much attention for the degradation of organic pollutants, the splitting of water and the reduction of CO2, but the studies on photocatalysis for C-H activation and C-C coupling of small molecules are rare. Previously, we found that HCHO could undergo reductive coupling to EG under visible-light irradiation over BiVO4 catalyst, but the EG selectivity was low (~40%) (Catal. Sci. Technol. 2016, 6, 6485; Catal. Sci. Technol. 2017, 7, 923). Moreover, the reduction of aldehyde group is not fundamentally so significant. Photocatalytic coupling of CH3OH to EG is much more scientifically significant because of the high challenging feature of preferential activation of C-H bond. Furthermore, methanol is an abundant and cheap C1 building block that can be derived from a variety of carbon resources including coal, natural or shale gas, biomass and even CO2. The direct synthesis of EG from CH3OH would offer an atom-efficient and non-petroleum sustainable EG production approach. However, most semiconductor photocatalysts such as TiO2, ZnO and g-C3N4 provided HCHO, HCOOH and CO/CO2 as carbon-based products instead of EG during the photocatalytic conversion of CH3OH. This suggests that the O-H bond is easier to activate. This is the case for many photocatalytic systems for H2 evolution with CH3OH as a sacrificial reagent. Therefore, the second key to the success is to find a semiconductor with “unusual property”. We discovered that CdS is very unique for the formation of EG under visible light. This is quite surprising because CdS is a semiconductor used in many photocatalytic reactions. It should be pointed out that Na2S-Na2SO3 instead of CH3OH are usually employed as sacrificial reagents for CdS-catalyzed H2 evolution or CO2 reduction. Thus, the previous work could not find such an interesting property of CdS in C-H preferential activation. The efficiency of CdS alone for EG formation remains low. Thus, the third key to the success is to find an efficient co-catalyst that can accelerate the EG formation. We discussed our new finding with Prof. Dehui Deng, whose group had just succeeded in synthesizing new structured MoS2 nanofoams with excellent H2 evolution activity in electrochemical process (Nat. Commun. 2017, 8, 14430). By addition of a small amount of MoS2 foams with rich edge sites onto our CdS nanorods (see Figure attached), we found more than 20 time enhancement in EG formation activity. More than expected, the EG selectivity was also increased to 90%. The EG yield could reach 16% by designing a process-intensified reactor with EG separation during the reaction. Our experimental work using ESR confirmed the formation of •CH2OH radical intermediate on the MoS2 foam/CdS catalyst, indicating the preferential activation of C-H bond in CH3OH. 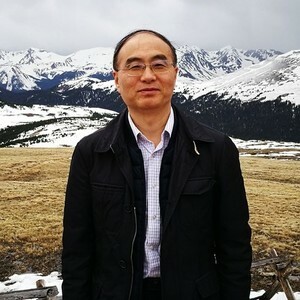 To understand more deeply why CdS has the ability to activate the C-H bond preferentially, we have collaborated with Professor Jun Cheng, who is an expert in theoretical chemistry. The DFT calculations suggest that the cleavage of C−H bond in CH3OH on CdS surfaces occurs through a concerted proton-electron transfer (CPET) mechanism driven by the photogenerated hole, producing •CH2OH radical with a low activation barrier. The weakly adsorbed •CH2OH can readily desorb from CdS surfaces, undertaking a thermodynamically downhill coupling to EG. On the other hand, on TiO2 surfaces, the OH group of CH3OH has a moderate deprotonation energy due to the strong interaction with the ionic oxide surfaces. It is therefore more likely to take a two-step PT−ET route via CH3O− to CH3O•, eventually leading to the formation of HCHO. The present solar energy-driven methanol transformation not only offers a non-petroleum approach for EG synthesis but also opens up an avenue for designing new reactions, in particular those involving preferential C-H bond activation without affecting other functional groups in the same molecule. For example, the high-selective transformation of CH4 to functionalized molecules may be realized by this method.